Exchange Server to MSG migrates all your mailbox private data in priv.edb which includes emails, calendars, tasks etc, while all your public or shared folders of mailboxes are stored in pub.edb file. 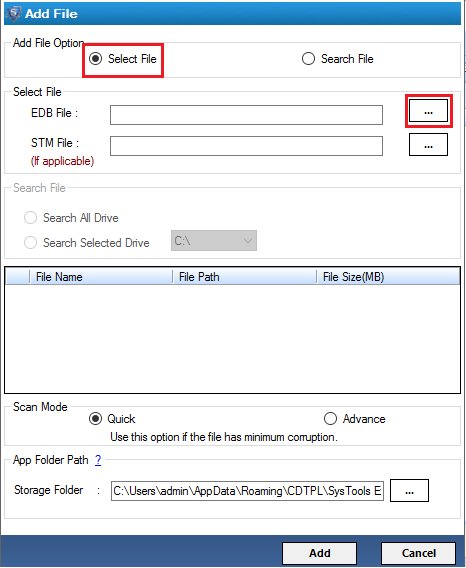 To convert Exchange to MSG file format the software also provides you with two searching options i.e Search All drive & Search Selected drive, to search files from entire drive or from selective drive. 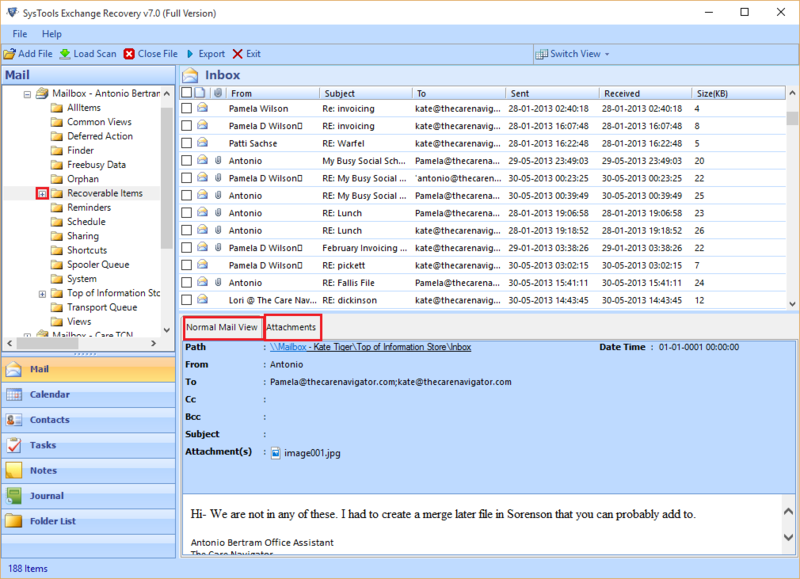 To recover highly corrupted files the Exchange export to MSG converter gives you the option to perform advance scanning to repair these highly corrupted files. By default Quick scanning is done, if the file is highly corrupted only then the advance scanning is performed. Exchange to MSG converter also supports Encrypted & password protected EDB files and convert it into MSG file format. 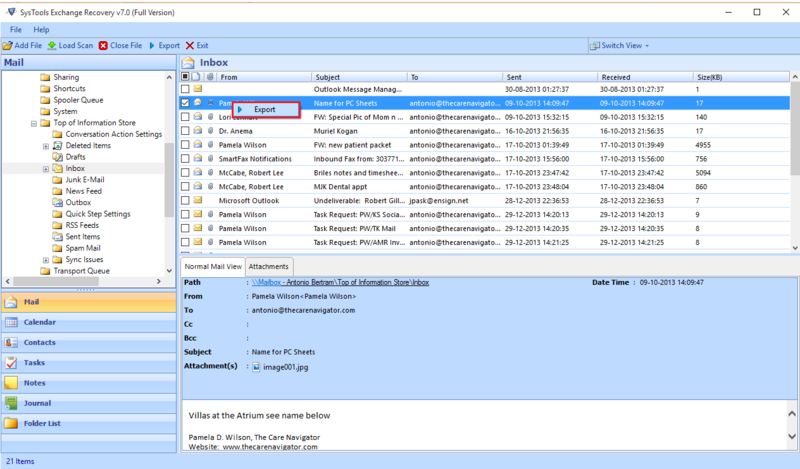 Exchange mailbox to MSG loads & scans all the mailboxes present in EDB file. You can open each mailbox and view the items in its folder. You can also preview the content of each component like: emails, contacts, calendars etc. with their attributes. The user can preview the attachments as well by clicking on the attachment tab, which is previewed on the bottom right corner. The software provides direct option to convert all items from exchange to MSG format. But you can check desired items to export only the selective items from each mailbox. You can select Mail Filter to set date range to all emails by specifying From Date & To Date. With this mail range, only those files get converted which are specified in the mail filter. The user can sort the mails according to the naming conventions that are available, the user can save the mails according to Subject, Date+Subject, auto increment etc. Go to Start » All Programs » EDB to MSG Converter. 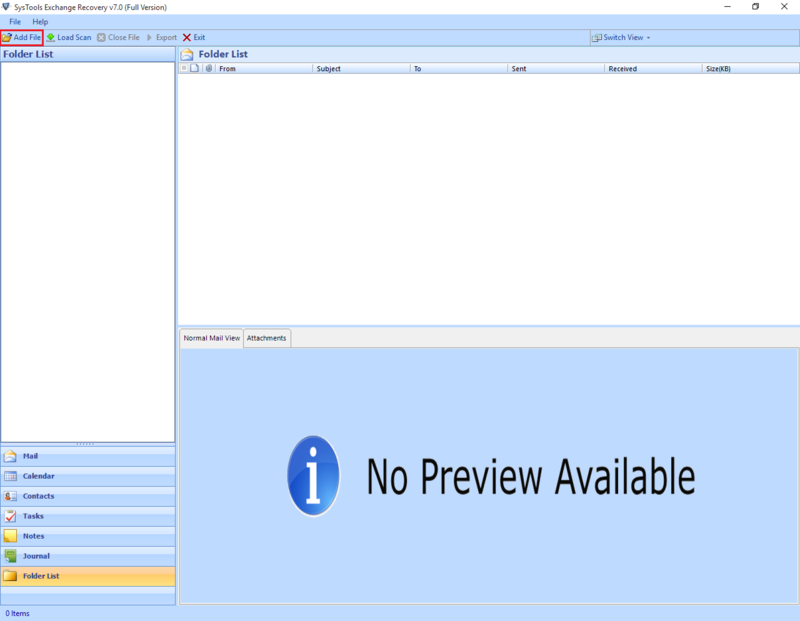 The window of the software appears as shown below, Click on Add File to add EDB file. Now you can select single or multiple emails & then Click on Export, to convert EDB file into MSG file format. Now, the software prompts Export option window providing us with Export As MSG option. A destination loction is provided in order to save the exported files, Click on the Browse button to choose the path. User can use Naming Conventions to view the mails accordingly. Naming Convention: this feature allow users to sort emails according to different conventions DD-MM-YYYY etc. Date & Time Option: this allow users to apply date & time with the range to retrieve mailbox items. Categories: with this option choose mailbox items. The option helps user to select the mailbox items like Mails, Contacts, Calendars, Tasks, Journals & Notes. 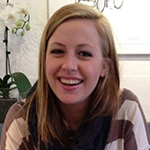 Can this software convert individual mailbox from large EDB Files? Can this software works on Windows 8 PC also? Yes, this software is compatible with all windows version. Does the attachment of emails also gets converted with this software? Yes, you can migrate all email attachments from an EDB file easily and can preview all the attachments in the bottom left corner of the screen. 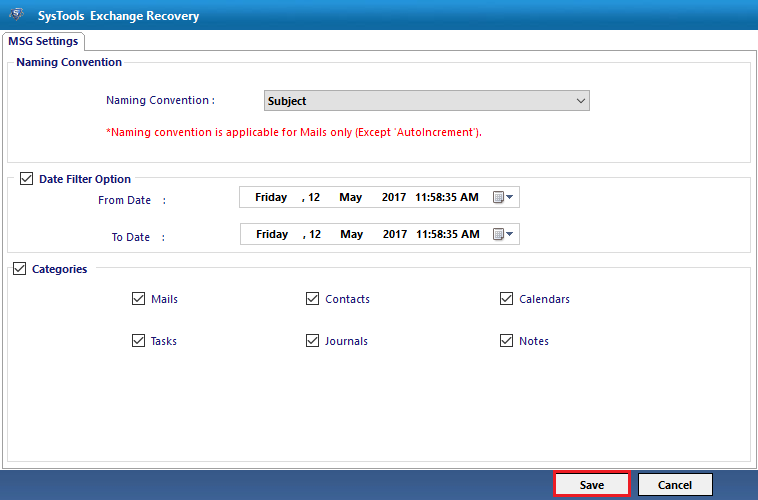 Is Outlook installation required on the conversion machine? 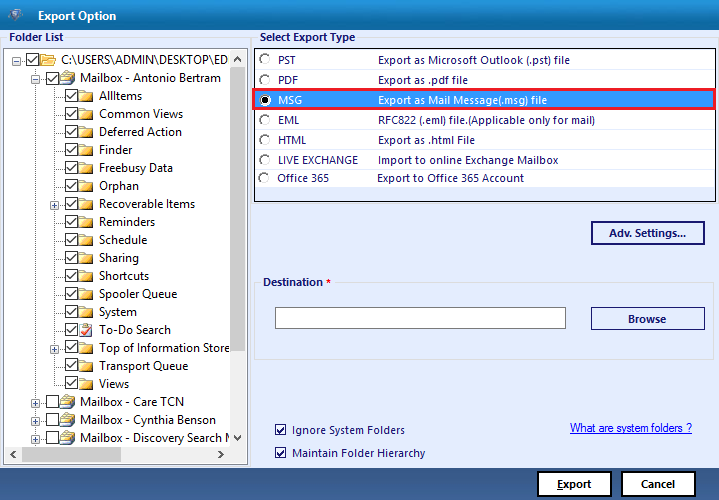 No, you can export EDB mailboxes to MSG without the need to install Outlook on your machine. Can I convert EDB file to MSG format without installing Exchange? Yes, you can migrate Exchange to MSG without installing exchange. 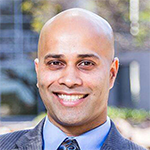 The software does not require exchange server environment for conversion. Even the EDB file should be offline and properly dismounted from the server. My EDB file is corrupted so I want to ask can I convert my Corrupted EDB file to MSG file format? Yes, the software always scan the EDB file to remove the corruption, if detected. You can use Advance Scan option to recover highly corrupted files and thus you can convert Exchange to MSG file format easily. Does the software also support heavily sized EDB files for conversion? Yes, you can migrate Exchange EDB file of any size to MSG file format by using Exchange to MSG converter. There is no file size limitation imposed by this software. Exchange to MSG converter is well integrated tool which can efficiently handle EDB to MSG conversion. This tool helps me alot as my EDB file was corrupted then one of my friend recommend me to use this software. I’m happy as my EDB file data is secure now. Using Exchange products always gave me the feeling of it being very difficult to use. But when I use Exchange to MSG converter, I was amazed with the GUI, it is user-friendly and easy to use software. All thanks to this tool for converting my EDB file to MSG.